Book Signing takes place from 6pm - 7pm. 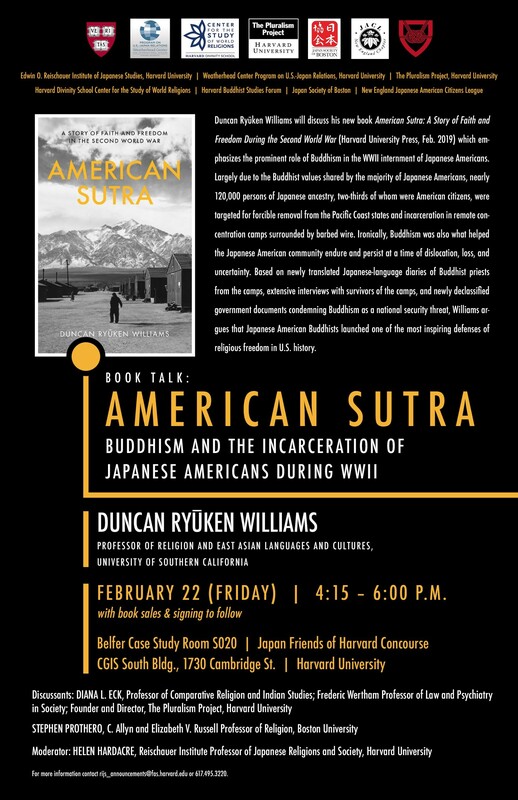 Duncan Ryūken Williams will discuss his new book American Sutra: A Story of Faith and Freedom During the Second World War (Harvard University Press, Feb. 2019) which emphasizes the prominent role of Buddhism in the WWII internment of Japanese Americans. Largely due to the Buddhist values shared by the majority of Japanese Americans, nearly 120,000 persons of Japanese ancestry, two-thirds of whom were American citizens, were targeted for forcible removal from the Pacific Coast states and incarceration in remote concentration camps surrounded by barbed wire. Ironically, Buddhism was also what helped the Japanese American community endure and persist at a time of dislocation, loss, and uncertainty. Based on newly translated Japanese-language diaries of Buddhist priests from the camps, extensive interviews with survivors of the camps, and newly declassified government documents condemning Buddhism as a national security threat, Williams argues that Japanese American Buddhists launched one of the most inspiring defenses of religious freedom in U.S. history.